As of 2016, NHTSA reported about 5.6% rise in deadly car crashes compared to 2015. More than 37 thousand people were killed on US roads, kicking the country back to the naughtiest after the years of improvements in fatal car accident statistics. Distracted and impaired driving, speeding and not wearing seatbelts are still among the most common causes of the fatalities, but NHTSA tries to look further, researching pre-crash scenarios to minimize risks of car accidents and to prevent associated deaths, injuries and property damages. Based on the latest NHTSA findings, we marked out some of the pre-crash scenarios posing threats of both major and minor car accidents, especially when it comes to novice drivers. And we collected helpful recommendations on driving in various road situations, using both traffic regulations set out in driver’s manuals and advice of professional driving instructors. This article will help you develop good driving habits that can save your life and lives of other people, not to mention your money and property. According to the Insurance Institute for Highway Safety, in 2015 about 800 people were killed and almost 140 thousand were injured in car accidents associated with red light running. And 22% of all urban crashes were caused by drivers ignoring red lights and stop signs – this is the most common cause of urban car crashes! That’s why it is extremely important to observe those rules of the road covering traffic controls like traffic lights and stop signs. When you see a steady red light, you must stop COMPLETELY before entering the intersection, even if a right turn on the red is allowed there. Remember that gunning into intersections after the light has turned red, as well as your failure to stop before turning right is dangerous and considered as a violation. You must stop either before the limit line, if it is marked, or before the crosswalk, if any. If there is no marking, you must stop without intruding into the intersection. When sticking your car out, you risk getting hit by an oncoming vehicle, so slow down in advance or, if you have failed to, back up safely. You may be caught when running an intersection by changing traffic lights – in this case, you have to go on with your maneuver and to complete it as soon as possible to clear the roadway for other road users. Though staying in an intersection at the time of the signal change is not considered a violation, this is a hazardous situation, so you should refrain from entering the intersection if the green light has already changed to yellow. Make sure to always slow down arriving at an intersection, when a yellow signal is observed since it can quickly change to red. Besides, traffic rules allow entering an intersection against a yellow signal only if a driver cannot stop the vehicle without hard braking, which can lead to a car accident. In all other cases, the yellow signal requires to STOP before entering the intersection, while many drivers accept this signal as a kind of call to quickly pass the intersection. When turning right against a red light, you must yield to all road users who are moving on their green light. Also, make sure there is no prohibiting sign, preventing you from turning right on the red signal. It is a big mistake to turn right trying to observe the traffic on the go – do stop to scan oncoming traffic carefully. You can be permitted to turn left against a red light, but only if you are turning from a one-way street to another one-way street. In this case, you need to make sure that there is no sign prohibiting the turn, then stop completely before traveling through the intersection and then yield to other road users by the right-of-way. Watch for red arrows, too. They are used to prohibit movement in certain lanes – you cannot proceed with your maneuver even after stopping until the green light/arrow is observed. When the red light is flashing, you have to act like in a situation with a stop sign – you are required to stop completely, then to make sure that you are not violating somebody’s right-of-way, and only after this, you can continue. Based on the Federal Highway Administration data, more than half of all deadly car crashes in the United States are caused by road departure, leading to thousands of killed people. While the administration is busy with the development and implementation of special programs improving pavement friction and nighttime visibility, drivers should take their own precautions to minimize the risk of this type of accidents. Most of the curve-caused car accidents happen due to speeding. So, don’t miss any road signs helping you understand that there is a curve ahead and suggesting a safe speed. Both gradual curves and sharp turns are usually marked with special yellow-colored warning signs depicting arrows that give the direction of the turn or curve, as it is shown on the card. Also, there are yellow and black chevron arrows usually grouped together to mark the beginning and ending of risky curves. When you see any of these signs, do reduce your speed, refrain from passing and try to stick to the right of your lane. The warning signs can be complemented with an advisory speed sign, specifying the maximum safe speed you should choose to travel around the curve without the risk of running off the road. Though you are not required to strictly obey advisory signs, you’d better follow the recommendations or even choose a lower speed. And it goes without saying that you must stick to the speed limits specified by a corresponding speed-limit sign if any. There can be curves without any speed limits posted before them, and so you will need to adjust your speed on your own. Do consider not only the sharpness of the curve but also all current road conditions. When it rains or snows or the road is covered with mud, ice or gravel, you should keep in mind that it is slippery and thus, it will be even more difficult for you to control the car when traveling around the curve. Besides, curves and turns limit visibility ahead of you, and you need to assume that around the curve, there can be some unexpected obstacle on the road, for example, a stalled car or a slow-moving vehicle. To reduce your speed to the safe limit BEFORE entering the curve or turn. It is dangerous to brake when you are on the curve since this can cause skidding. To mitigate the risk of skidding and running off the road, you can apply a method that consists in reducing your turning radius. When entering a curve, stick to the side of your lane that is opposite to the direction of the curve. When driving through the curve, direct your vehicle towards the other side of your lane and then exit the curve, steering towards the opposite direction again. Don’t take curves too wide to avoid leaving your lane, but also don’t drive too close to the center of the road to escape a head-on collision – a driver moving in the opposite direction can accidentally cross the central line. But don’t brake hard or steer sharply to correct your vehicle position! You can gear up your car when exiting the curve, but don’t make this too early – accelerate, when you see the straight road ahead of you. By accelerating too early, you risk skidding – watch this helpful video to understand how you can handle skidding. Back up accidents are associated with both people’ deaths/injuries and property damages. According to an IIHS report, annually almost 300 people get killed, and 15,000 get injured, when hit by backing up drivers. Correspondingly, the figures for backing up into another vehicle, a building, and other objects are much higher. SUVs and small trucks top the list of vehicles, which are most often involved in such a type of accidents, while the most frequent sites for them are parking lots and residential driveways. Unfortunately, children under 5 and elderly people are the most vulnerable groups to back up collisions, and many of them are hit by drivers, who are their relatives or acquaintances. These facts show how dangerous can be even routine maneuvers, performed by drivers every single day. Know blind spots on your vehicle. Obviously, you should start with adjusting your mirrors so that to reduce the very possibility of blind spots. And sure, you need to check your mirrors each time you get in your car. But the truth is that blind spots depend on your vehicle’s design, and so you cannot avoid them completely. Keep in mind that blind spots can be found not only behind your car but also on both sides and in front of it, while their sizes vary depending on a car size (larger vehicles have larger blind spots). You can easily detect your vehicle’s blind spots by asking someone to go around your car and watching the person through your mirrors – when you cannot see the person via the rearview mirrors, there is a blind spot. The image below shows where blind spots are usually hidden. Turn your head. Resign yourself to the fact that neither rearview mirrors nor modern electronics like parking sensors or rearview cameras can guarantee that there is no one staying in a blind spot of your car. You should look over your shoulder or even look out of the car to make sure your blind spots are clear. Make it a kind of ritual you repeat each time before backing up, especially when at sites where kids can appear unexpectedly. Walk around your car before backing up. By doing this, you will make sure that no one staying behind your car and there is no other obstacles or hidden dangers like potholes or slippery areas. It sounds boring, but by looking behind the car before getting in it, you can also better estimate a distance between your vehicle and the nearest object – this is especially helpful for novice drivers who haven’t developed their judgment skills yet. Use defensive parking. Give preference to easy-exit sites and don’t try to squeeze your car in crowded spaces. When parking, position your car in the center of the parking space to facilitate its exit and to avoid sticking to other vehicles. Ask for help. If your car is really large or the parking space is really tricky, ask somebody to help you with backing up. But make sure that you and your assistant understand each other clearly – agree upon hand signals you will use beforehand. Watch out for other vehicles backing up. 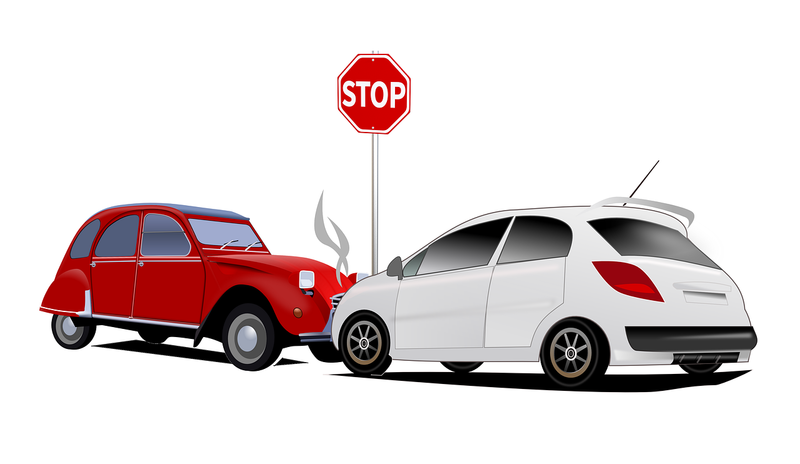 You can prevent a car accident by warning the other driver of the danger of hitting your car or by taking a proper maneuver to steer clear of the hit. It is especially true for large trucks and buses since they have many blind spots. And don’t try to pass until the truck completes its maneuver! An IIHS research on pedestrian crash scenarios shows that hitting a crossing pedestrian when turning is the third in frequency among all automobile-pedestrian accidents. Moreover, the same situation is observed in automobile-bicycles crashes – turning vehicles often hit bicyclists both crossing and moving in line with traffic (23% and 10% respectively). And feel certain that many vehicles collide when one or even several of them try to perform some kind of turning maneuver. So, it is time to remind you of those rules you need to follow when turning. Be predictable. Show your intentions to other road users before starting your maneuver. Don’t fail to use your turn signal just because you suddenly see a gap in traffic flow and want to move into it as soon as possible. Usually, operator’s handbooks recommend showing a proper signal at least 100 feet or one block before the turn. Get to the right lane. Think ahead and watch for markings and signs that show you which lane is designated for turning either left or right. Also, remember that there can be signs prohibiting turning left or right. Here are the examples of signs, indicating lanes permitted for turning and prohibiting the maneuver. If you need to change your lane, make sure to observe the traffic behind your car and on both sides of it. Move to the required lane only when you are sure it is safe. Slow down smoothly, while approaching the turn. Before entering the turn, observe oncoming traffic carefully and yield to vehicles having the right-of-way. The following schemes serve to remind you about right-of-way on uncontrolled intersections. Also, watch for pedestrians and bicyclists – don’t forget that bicycles can travel in line with you. This is a helpful video, summarizing safe driving tips for turns. Watch where you are turning to. There are one-way streets and two-way streets, and your choice of lanes depends on this fact. Again, look for prompting pavement marking and signs, showing where you are allowed to turn into. Also, refresh your knowledge of the local traffic regulations, as in some states like Arizona or Florida it is prohibited to turn into the right lane of the crossroad when turning left. You are only allowed to occupy the left lane, as it is shown below. And don’t "cut corners" exposing your car to oncoming vehicles – this increases the risk of collision. When you complete the maneuver, make sure to turn off the signal to avoid misinforming other drivers. As for U-turns, you are prohibited from making them at railroad crossings, on one-way streets, on spots marked with a corresponding prohibiting sign, in business districts and on divided highways where dividing constructions or two sets of double yellow lines are used. Here is a list of locations where U-turns are usually allowed and a helpful video about making U-turns safely and legally. vehicles merging into other’s lanes. Choose your lane correctly. Remember that usually the right lane of a two-lane road and the middle lane of a three-lane road is designated for smooth driving in traffic flow, while the leftmost lane is intended to safely pass other vehicles, which go at a slower speed. Also, keep in mind that both right- and left-hand lanes are used for turning right and left correspondingly. So, look at the following example of traffic lane usage and plan your driving scheme ahead, choosing your lanes correctly. Watch for signs and pavement markings. In some cases you are not allowed to cross lines, separating traffic flows, as well as you are prohibited from occupying certain lanes. The following examples of lane marking will remind you of the situations when you can or cannot cross the lines. Avoid weaving in and out of traffic and don’t change lanes unexpectedly, even when showing your intention to other drivers at the last moment. Other drivers may not have time to react properly, while you will hardly be able to assess the road situation adequately – both factors are likely to lead to an accident. For the same reason, do not try to pass several lanes at a time – switch from one lane to another gradually. And never change lanes when traveling through an intersection! Make sure to show your intentions in advance. Use your turn signals properly and give other drivers some time to adjust to your intentions. Watch, watch and watch. It doesn’t matter whether you enter a lane moving from the curb or from another lane, whether you want to pass or turn – always check that the lane you are switching to is clear using both rearview and side mirrors. If there are more than two lanes on your side of the road, you should check for another car aiming at the same gap you have planned for yourself, so look two lanes further. Also, remember about your blind spots and check them by looking over your shoulder. Search for motorcyclists and bicyclists, as they are the least visible road users. Adjust your speed to the speed of traffic flow in the intended lane and make sure there is plenty of space for your car to move in. Avoid cutting in and be ready to react if somebody cuts you off or the vehicle behind you brakes suddenly, while you are changing lanes. Keep in mind that during the maneuver you need to simultaneously control what is going on in front of you and on the side that you are switching to. Run another mirror check right after you entered the intended lane. You need to be sure there is no other vehicle quickly approaching your car. Also, don’t forget to turn off signals to inform other drivers that you have completed the maneuver. Give yourself enough time to observe the road situation before starting a new maneuver like turning or changing your lane again. Check if you perform the maneuver correctly and safely by watching this video. As you may notice, many of the tips that can save your life are based on recommendations given in local operator’s manuals. And this is the great reason for you to review the traffic regulations of your state again. You can do it easily and even have some fun by taking our convenient sample test illustrated with multiple useful images. Do pass the test for your state to learn how to reduce car crash risks! Can Lane Filtering Cut Down on Rear-Enders?